The story shifted a bit for this race. We—my buddy William “Chip” Corley and I—learned on Thursday that there was an option of starting the race on Friday night at 10:00 p.m. versus the 8:00 a.m. Saturday start. An 8:00 a.m. start unsettled us. We had a plane to catch Sunday afternoon. The hours didn’t add up – we would finish the race, shower, then drive back to Tulsa, return the rental car, and board the flight with no sleep? It didn’t seem possible to me that would all occur, and that I would be in my college classroom ready to teach Monday morning at 8:00 a.m. The Friday night start time was appealing. Sure, it meant we would go into this race more sleep deprived than usual, but it also meant finishing early on Sunday, which provided the opportunity to rest for a few hours before heading to the airport. The thing was that the Friday night start involved a 135-mile race. The Race Director assured us there was no penalty if we dropped down to the 100-mile race, but it meant that we would have to cover at least 105 miles to get back to the start line. We decided to go for it. With a few hours till the race start, we packed our drop bags in the pre-race meeting parking lot, then headed to the race site, where we parked, changed into our run clothes, and attempted to sleep in the car for a few hours until the 10:00 p.m. start. At the start line, I intercepted Badwater buddies Dale and Carl, which helped to calm my nerves. I was tired, nervous, and the dewy mist and cool air concerned me—I was a long way from hot and humid Florida! In typical Chip fashion, he opted to sleep until 9:45 p.m., giving himself all of 15 minutes to get ready for the race. Of course he was first walking over to the start line when we all had crossed the start mat and were on our way. Our course consisted of an eight-mile out and back, for a total of 16 miles, and then three loops on the actual course, with each loop consisting of 29.7 miles; 135 mile participants would complete four loops. As soon as I started to run, my energy shifted and I was alert. It was really dark out, and I had no idea where I was, other than seeing the retro sign for Eagle Bluff Resort as we made our way off the road and into the trail. As the 20 or so of us spread out, I started to ask myself what I had gotten myself into. I had really been looking forward to getting a good night’s sleep Friday night, so that I would be rested for the race start on Saturday. But now I was already running the race. About two miles in, Chip caught up to me, and we journeyed up the first of a number of steep hills together. I was huffing and puffing, the cool, damp air not helping my shortness of breath. Back to flat land, we wished one another a good race, and Chip was off. I had a hunch he was going to win the race, and seeing him drift by effortlessly, it was confirmed. About five miles into the out and back section, something strange happened. I forgot I was in a race. I sighed at the luxury of having the space and time to decompress from my week, think through client meetings, smile at the dozens of funny classroom moments that make up my professor gig. I started to think about what I had to accomplish the following week, and then I was looking around at the massive trees and what I supposed was greenery. I was taking in the trail, a blend of gravel and dirt, and leaves falling in bunches from trees. Above, the full moon dominated the sky and the sound of crickets and all of the wild things of the night serenaded me. I was in the middle of nowhere, very much alone out there, but just then, I wasn’t afraid. The side of me that craves being alone in the forest, removed from my life, was enjoying every step. Soon, I reached the eight-mile turnaround, and the support vehicle that was tending to the group of us was there, asking me what I needed, which was nothing just then. As the turnaround was underway, I intercepted other runners, and then I was heading back to the start line, from which I would head out on the main loop of the race. Those first few hours were magical in their way. But of course as the race unfolded, I forgot about them. By the time I was back at the start/finish to head out on my first loop of 29.7 miles, I was falling asleep. I grabbed a caffeinated drink, slugged it down, and was on my way. It was hard to imagine it was only after 1:00 a.m. and already I was exhausted. The loop was dark and lonely. Really dark. A few miles in, the barking dogs started up. I convinced myself that they were tucked away in homes, far away from the trail I was on. But the barking persisted, and at times, it sounded awfully close to me. As the majority of Pumpkin Holler races –100 miles, 100K, 25K and 10 miler—didn’t start until the next morning, the aid stations were either nonexistent or in the midst of getting organized. By 11 miles into the loop, my head nods were at full force, and I was in a sleep-walking trance. I needed soda. Or sugar. I debated my options. I had no idea if the next aid station was close or if it would be set up. Going back and sleeping and starting at 8:00 a.m. seemed like the best option. But who knew if I could make it around the loop? There were stretches in which there were no dogs, and then stretches in which I heard a lot of dogs. Then there was the flow of water from the Illinois River, which bordered the course along many miles; it wasn’t until daylight that I was able to take in the magnificence of the river. There were long and intense climbs, followed by fast-moving downhills. There were thousands of sparkly spiders in trees, on the ground, everywhere. A few times, pickup trucks drove by, and people in them waved, so I knew they were part of the race staff. I love the country, but I don’t love the dark hilly corners of the earth where you can vanish. My mind kept playing horror movie scenarios with me. It was a solitary loop – meaning if you didn’t start within the vicinity of someone, it was unlikely that you would see anyone the whole loop around. When I heard strange noises, I often paused, looked behind me, and then ran as fast I could until the exhaustion set back in. Before the sunrise, I had my scariest moment: a man in a pickup truck stopped as I was approaching, and got out. “Hello?” I faltered, face to face with him. “Hello ma’am,” he said. Panicked, I took off. Of course he was likely out at 5:00 a.m. for a reason, but I didn’t stick around to ask him. Coming into the start/finish, I guzzled a caffeine drink, drank some Coca Cola, and ate a handful of M&Ms before heading out on the second loop. When desperate to wake up, I resort to desperate measures. Daylight, along with the fact that I was some 45 miles into the race, induced euphoria. I grabbed my music, and I was off. Being able to see all of the creepy crawlies and the barking dogs enabled me to lessen my laser focus, which gave me more energy to run. That, coupled with the fact that the route was now packed with 25K runners, 10 mile runners, and a 100 miler or 100K runner here and there, boosted my spirits. I was able to appreciate the beauty of the course: the leaving trees; the broad, wide-open pastures, full of roaming horses and cows. There were also chickens, roosters, dogs, rabbits, a skunk, deer, and one stray kitten. It was during this loop that I met the incredible Lemaster family who manned the Mad Dog aid station about five miles into the loop. The little Lemaster girl made me French toast hot off the grill—a food I had never eaten at an ultra—and proceeded to tell me all about her being in charge at the aid station and how her brother did nothing. “I do nothing,” he chimed in, swinging on the hammock. “I try to do things, but then I don’t. My sister does everything.” She nodded in agreement. “He’s lazy,” she said, matter-of-factly. The French toast reminded me of my mom; for years during growing up, she made me French toast for dinner. Often it was all that picky-eater me would eat. Eventually, it was time for me to depart, at which time brother and sister cheered me on, and told me to take some M&Ms with me. For the next few hours I ran along in bliss, singing my tunes at the top of my lungs, and engaging in some conversations with cows, horses, and secured dogs. Towards the end of the second loop, after I had been chased down by a barking dog who grabbed my shirt sleeve in his teeth, not leaving my side for a good half mile, my mood began to shift once again. I thought about my life and what mattered to me. I enjoy running – for some 20 years it has provided me with a source of freedom and a chance to look around. But this time I was able to say that right then, running ultras didn’t make me feel free. Rather, it made me feel tired and hectic. It made me feel as if I was in a constant state of movement, and the faster I tried to go, the more tired and slower I became. I promised myself that I would finish up the last few races on this year’s calendar and then take a bit of a hiatus. Focus more on writing, on my yoga practice, and return to one of my first athletic loves: ice skating. Because in the world we live in, we can do a lot, but we cannot always do everything we seek at the same time. Our careers own a lot of real estate in our lives; I have always been okay with that as I choose careers I am passionate about. But right then, in the midst of the race, it loomed clear to me: outside of my career, I was not always pursuing the things I love. What was also clear was that it was up to me to make changes. 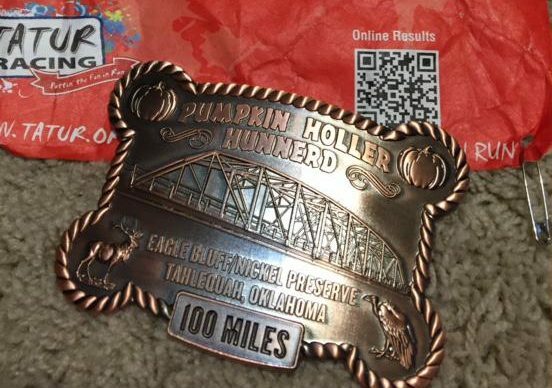 If it took running another 100 miler to figure that out, then I am forever grateful to Pumpkin Holler. I don’t have one race on the calendar for next year. If one should show up, it will be because I feel passionate and excited to get out there and run long and far, versus signing up just because. Starting on my third and final loop, I was ready to be done. It took a bit of will power and courage on my end to muster up my energy reserves and head back out to the world of darkness and solitude. About three miles into the loop, I had my first encounter with a Copperhead snake. While I hung out at my favorite aid station—Mad Dog—I was informed that the guys up ahead of me had also seen a few Copperheads right along our path. It was going to be a long night! By the time I reached the 11-mile aid station, I was in trouble again; my eyes were falling shut. Luckily, it was here that I intercepted Mike, who was running the 100K race, and his friends RJ and Kathryn, who were running the 100-mile race for their second attempt, and were out on their second loop. I told them I was falling asleep, and immediately, they adopted me. The hour or two I spent with them was the highlight of my race. Their conversations kept me awake, and their run/walk patterns put me back into a groove: together, we ran all of the downhills and powerwalked the climbs. They also warned me about the teenage kids up ahead, who would be waiting to jump out and scare us when we approached. If I had been alone, I cannot imagine my fright when the kids did jump out on the course and scare us. Everything was great and upbeat for me until around mile 90, when I had my first bout of nausea. Within a few minutes, I was throwing up. I told the gang that I was sick, and that as soon as it passed, I would try to catch up with them. That’s when the longest death march of the race commenced for me. With just over 15 miles to go to reach my 105-106 finish line, I was reduced to walking, stopping to get sick, and resuming walking. The only time I sped up was when I saw and heard trucks in the distance; then I somehow mustered up the energy to push forward! With each head nod, I reminded myself to stay alert and keep my eyes trained on the ground to beware the snakes. Having been with the group for a bit, our collective eight eyes made it easier to watch out for the snakes. Slowly, I chipped away at the miles. I struggled through the last few, but when I reached the final three-mile stretch, I did my best to trot them in. Crossing the finish line, it didn’t seem possible that it was over. While I never doubted my ability to finish this race, from early on, it didn’t seem possible for me to get through it. It wasn’t so much about my lack of commitment as it was that I felt like I had other things I would have rather been doing, such as sleeping. But then along the way, I grew peaceful within myself. The version of me who excels in focus, in one step at a time, in deep breaths and light-hearted thoughts, surfaced. I reminded myself that it was about forward movement. Chip, on the opposite end of the spectrum, had a great race: he finished first place all-around for the 100 miler, which was actually a 105-106 miles for him. Standing in front of my 8:00 a.m. class Monday morning, after landing from Oklahoma after 10:00 p.m. Sunday night, the idea of running 105-106 miles at Pumpkin Holler over the weekend seemed like it never happened. But maybe that is the quiet magic of running ultras—it did happen, and while to the outside world I look and act the same, over the weekend I grew. I got to know myself a bit better in terms of what I think, feel, how I react to pain, fear, and what it means to push through my thresholds. While ultras in no way define those of us who run them, they help us to define aspects of ourselves that may otherwise go unexplored. Ultras perhaps teach us how to manage ourselves in stressful situations. They teach us how to change the channel when we grow bored and tired of ourselves, as we inevitably do. They teach us to be patient with ourselves, but not to waste time. While this particular race did not evoke thoughts of joy and fun for me, on Monday, I felt alive again, invested in life, and in all around me. The sleepiness vanished when I returned to my world, leaving in its wake vigor and excitement, and for that, I am grateful for going the distance. Great narrative! Especially the part about my kids! Glad you liked the french toast! !